Here is a link to a video tutorial that shows the process that I went through to create the tensile shading devices. It explains the process and steps needed to create the form. Generally, the idea was to create a tool that will allow me to go through thousands of iterations before I can make the final decision. I have used a Grasshopper and Galapagos to search for the most optimized shading form. I also set it up to use Ecotect to perform solar analysis on each form. The result from the analysis became the fitness factor for the evolutionary solver – Galapagos. 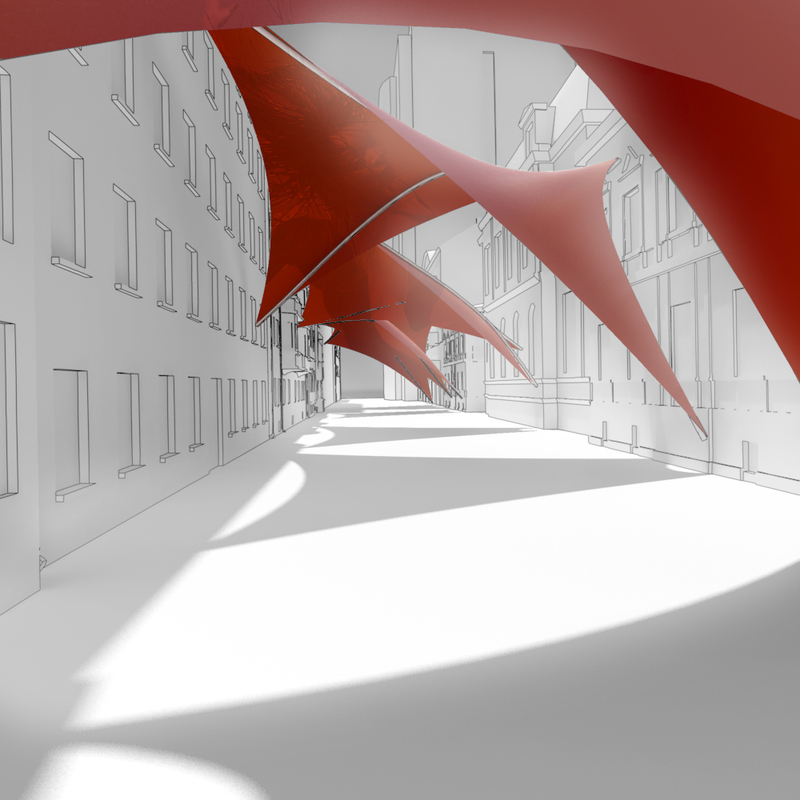 The fitness value – the goal – was to create a shading device that will absorb the most sun and thus screen the most street below. Another plug-in that I was using was the physic engine – Kangaroo. It’s quite a marvelous software. It allows you to set up some real life based forces to create all tension or compression structures. It’s almost like Gaudi’s hanging models but on the computer screen and much faster. Combine that with the Galapagos and you create an ultimate form finding tool. Initially I have started working on this as a submission for the Design by Many Street Shading Competition, however due to other commitments I wasn’t able to submit it on time. I hope others still find it useful. Feel free to shoot me an email if you want have a look at the definition. I will be happy to share my files. Really nice work, i am very interested to how u manage to get your results. I am trying to do something similar, where the components are some shelds in the facade and the objectif is how i can find the best position in rotation of each to get the minus dayli hour sunllight incident. I believe i can learn with your study and get some information that could be helpfull for my project. This is something that I have posted so many years ago, that I don’t even remember what happened to the computer that I created this definition on. Sorry, but I don’t even have the files in question.